Having used a CGM for years (and years and years, and years before that), and having chosen to build a DIY system that provides smart alerts and recommendations based on said CGM data (learn more about my #DIYPS system here) and ultimately using CGM data to build the open source closed loop system that automates insulin delivery (find out more about #OpenAPS here)…I’ve learned a few things about how to get the best data out of my sensors. 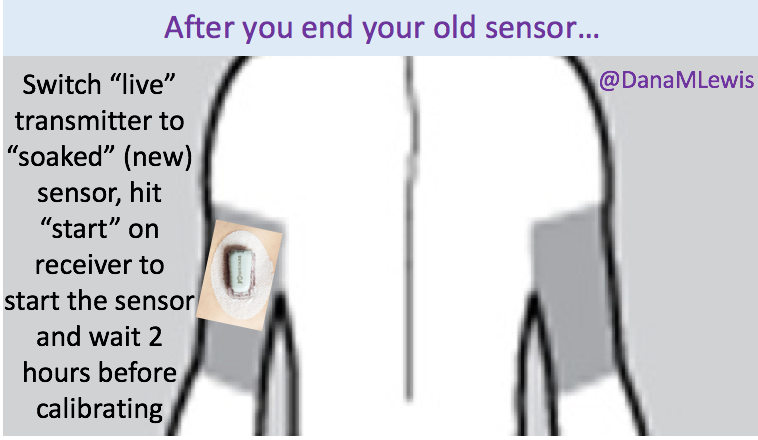 Currently, I’m using Dexcom, so this applies to the Dexcom sensors. However, 12-24 hours before I expect my sensor to end, I insert my next sensor into my body. To protect the sensor (you don’t want the sensor filament itself to get torn off or lost in your body), I plop an old (“dead” battery) transmitter on it. If you don’t have an old/dead transmitter, you could try taping over it – the goal is just to protect the sensor filament from ripping. 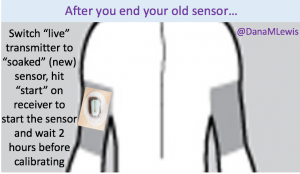 I take the “live” transmitter off the old sensor, and remove the old sensor from my body. I hit “stop sensor” on my receiver, if it hasn’t already stopped itself. I gently remove the “dead”/old transmitter from ‘new’ sensor. I then stick the “live” transmitter onto the new sensor. I hit “start sensor” on my receiver. As mentioned in the previous post, we had the privilege of coming to New Orleans this past weekend for two events – #DData16 and the American Diabetes Association Scientific Sessions (#2016ADA). A few things stuck out, which I wanted to highlight here. The focus was on artificial pancreas, and there was a great panel moderated by Howard Look with several of the AP makers. I was struck by how many of them referenced or made mention of #OpenAPS or the DIY/#WeAreNotWaiting movement, and the need for industry to collaborate with the DIY community (yes). I was also floored when someone from Dexcom referenced having read one of my older blog posts that mentioned a question of why ??? was displayed to me instead of the information about what was actually going on with my sensor. It was a great reminder to me of how important it is for us to speak up and keep sharing our experiences and help device manufacturers know what we need for current and future products, the ones we use every day to help keep us alive. Mark Wilson gave a PHENOMENAL presentation, using a great analogy about driving and accessing the dashboard to help people understand why people with diabetes might choose to DIY. He also talked about his experiences with #OpenAPS, and I highly recommend watching it. (Kudos to Wes for livestreaming it and making it broadly available to all – watch it here!) I’ve mentioned Mark & his DIY-ing here before, especially because one of his creations (the Urchin watchface) is one of my favorite ways to help me view my data, my way. Howard DM’ed me in the middle of the day to ask if I minded going up as part of the patient panel of people with AP experiences. I wasn’t sure what the topic was, but the questions allowed us to talk about our experiences with AP (and in my case, I’ve been using a hybrid closed loop for something like 557 or so days at this point). I made several points about the need for a “plug n play” system, with modularity so I can choose the best pump, sensor, and algorithm for me – which may or may not be made all by the same company. (This is also FDA’s vision for the future, and Dr. Courtney Lias both gave a good presentation on this topic and was engaged in the event’s conversation all day!). 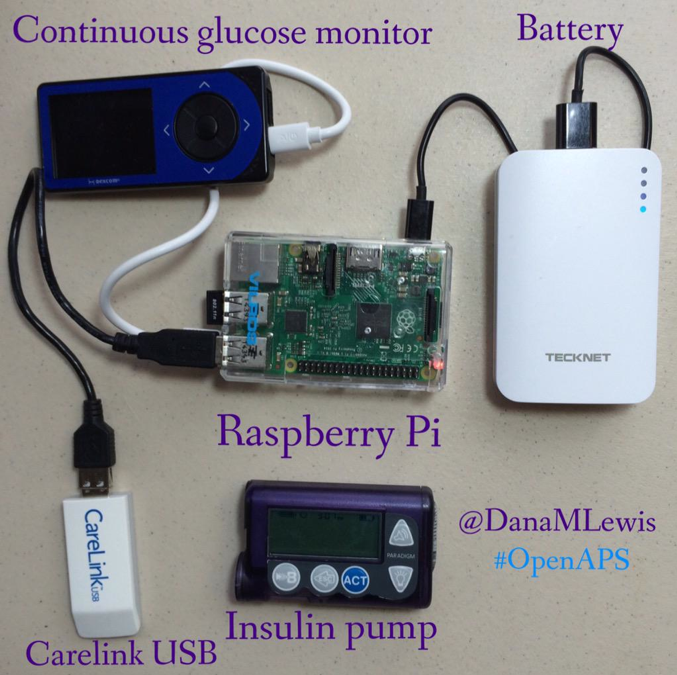 First, everything about #OpenAPS is open source. The content of our poster or any presentation is similarly open source. Not everyone had time to come by the poster. Not everyone has the privilege or funds to attend #2016ADA, and there’s no reason not to share this content online, especially when we will likely get more knowledge sharing as a result of doing so. Frustratingly, some people were asked to take down posted photos of our poster. If anyone received such a note, please feel free to pass on my tweet that you have authorization by the authors to have taken/used the photo. This is another area (like the need to develop patient research access programs) that needs to be figured out by scientific/academic conferences – presenters/authors should be able to specifically allow sharing and dissemination of information that they are presenting. Why are patients doing this? Here’s my why: I originally needed louder alarms, built a smart alarm system that had predictive alerts and turned into an open loop system, and ultimately realized I could close the loop. What can we learn from the people who are DIY-ing? One of my favorite topics, and what I was hoping would be a big part of the conversation. How can we further study the DIY closed loop community? This is my second favorite topic, which touches on a few things – 1) the plan to do a follow up study of the larger cohort (since we now have (n=1)*84 loopers) with a full retrospective analysis of the data rather than just self-reported outcomes, as this study used; 2) ideas around doing a comparison study between one or more of the #OpenAPS algorithms and some of the commercial or academic algorithms; 3) ideas to use some of the #OpenAPS-developed tools (like a basal tuning tool that we are planning to build) in a clinical trial to help HCPs help patients adjust more quickly and easily to pump therapy. What other pumps will work with this? How can there be more access to this type of DIY technology? We utilize older pumps that allow us to send temp basal commands; we would love to use a more modern pump that’s able to be purchased on the market today, and had several conversations with device manufacturers about how that might be possible; we’ll continue to have these conversations until it becomes a reality. There is some great coverage coming of the poster & the #OpenAPS community, and I’ll post links here as I see them come out. For starters, Dave deBronkart did a 22 minute interview with Scott & I, which you can see here. DiabetesMine also included mention of the #OpenAPS poster in their conference roundup. And diaTribe wrote up the the poster as a “new now next”! Plus, WebMD wrote an article on #OpenAPS and the poster as well. Scott and I walked away from this weekend with energy for new collaborations (and new contacts for clinical trial and retrospective analysis partnerships) and several ideas for the next phase of studies that we want to plan in partnership with the #OpenAPS community. (We were blown away to discover that OpenAPS advanced meal assist algorithm is considered by some experts to be one of the most advanced and aggressive algorithms in existence for managing post-meal BG, and may be more advanced than anything that has yet been tested in clinical trials.) Stay tuned for more! We’ve instead spent time spreading the word about OpenAPS in other channels (in the Wall Street Journal; on WNYC’s Only Human podcast; in a keynote at OSCON, and many other places like at the White House), further developing OpenAPS algorithms (incorporating “eating soon mode” and temporary targets in addition to building in auto-sensitivity and meal assist features), working our day jobs, traveling, and more of all of the above. Some of the biggest improvements we’ve made to OpenAPS recently have been usability improvements. In February, someone kindly did the soldering of an Edison/Rileylink “rig” for me. This was just after I did a livestream Q&A with the TuDiabetes community, saying that I didn’t mind the size of my Raspberry Pi rig. I don’t. It works, it’s an artificial pancreas, the size doesn’t matter. That being said… Wow! Having a small rig that clips to my pocket does wonders for being able to just run out the door and go to dinner, run an errand, go on an actual run, and more. I could do all those things before, but downsizing the rig makes it even easier, and it’s a fantastic addition to the already awesome experience of having a closed loop for the past 18 months (and >11,000 hours of looping). I’m so thankful for all of the people (Pete on Rileylink, Oscar on mmeowlink, Toby for soldering my first Edison rig for me, and many many others) who have been hard at work enabling more hardware options for OpenAPS, in addition to everyone who’s been contributing to algorithm improvements, assisting with improving the documentation, helping other people navigate the setup process, and more! That leads me to today. I just finished participating in a month-long usability study focused on OpenAPS users. (One of the cool parts was that several OpenAPS users contributed heavily to the design of the study, too!) We tracked every day (for up to 30 days) any time we interacted with the loop/system, and it was fascinating. At one point, for a stretch of 3 days, we counted how many times we looked at our BGs. Between my watch, 3 phone apps/ways to view my data, the CGM receivers, Scott’s watch, the iPad by the bed, etc: dozens and dozens of glances. I wasn’t too surprised at how many times I glance/notice my BGs or what the loop is doing, but I bet other people are. Even with a closed loop, I still have diabetes and it still requires me to pay attention to it. I don’t *have* to pay attention as often as I would without a closed loop, and the outcomes are significantly better, but it’s still important to note that the human is still ultimately in control and responsible for keeping an eye on their system. That’s one of the things I’ve been thinking about lately: the need to set expectations when a loop comes out on the commercial market and is more widely available. A closed loop is a tool, but it’s not a cure. 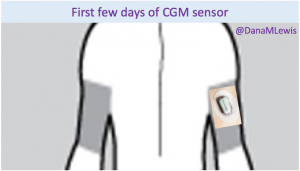 Managing type 1 diabetes will still require a lot of work, even with a polished commercial APS: you’ll still need to deal with BG checks, CGM calibrations, site changes, dealing with sites and sensors that fall out or get ripped out… And of course there will still be days where you’re sensitive or resistant and BGs are not perfect for whatever reason. 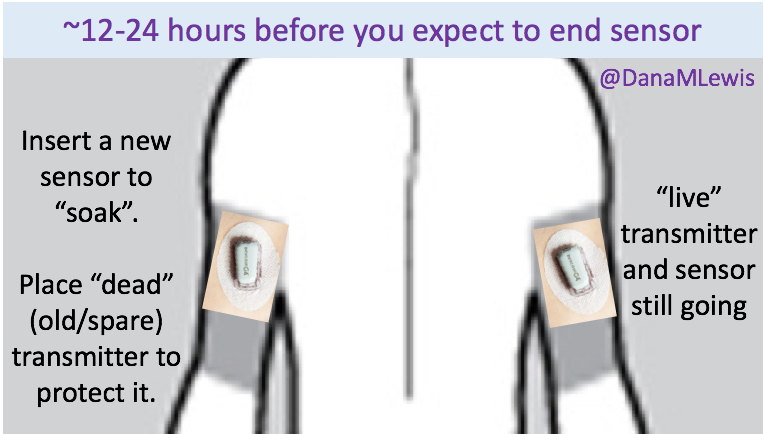 In addition, it will take time to transition from the standard of care as we have it today (pump, CGM, but no algorithms and no connected devices) to open and/or closed loops. This is one of the things among many that we are hoping to help the diabetes community with as a result of the many (80+ as of June 8, 2016!) users with #OpenAPS. We have learned a lot about trusting a closed loop system, about what it takes to transition, how to deal if the system you trust breaks, and how to use more data than you’re used to getting in order to improve diabetes care. As a step to helping the healthcare provider community start thinking about some of these things, the #OpenAPS community submitted a poster that was accepted and will be presented this weekend at the 2016 American Diabetes Association Scientific Sessions meeting. This will be the first data published from the community, and it’s significant because it’s a study BY the community itself. We’re also working with other clinical research partners on various studies (in addition to the usability study, other studies to more thoroughly examine data from the community) for the future, but this study was a completely volunteer DIY effort, just like the entire OpenAPS movement has been.